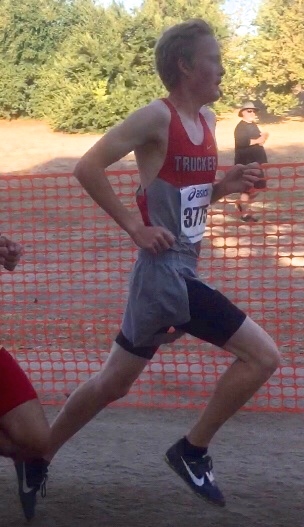 Calin Laine runs at the Clovis Invitational on Saturday, Oct. 7. The Asics Clovis Invitational at the Woodward Park 5,000-meter course in Fresno, Calif., is one of the largest and most competitive races in the country, bringing in nearly 200 teams from around California and Nevada. The Truckee cross-country team put together an impressive performance, finishing the meet on Saturday, Oct. 7, with 13 out of 23 athletes setting new personal records. The Truckee girls came ready to perform. The team placed fourth overall out of some very competitive teams in a field of 29. Carly Davis, a freshman, was Truckee’s top runner with a time of 19 minutes and 18 seconds for 18th overall out of 207 runners. 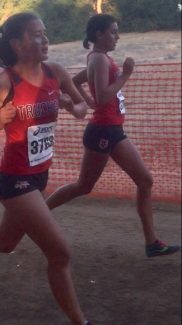 Sophomore, Isabella Terrazas (19:20) finished next for Truckee with 20th place. While freshman, Hanna Mazur (19:27) followed her in for a 25th-place finish. Deanna Sunnergren (20:41) and Amelia Swanson (20:55) rounded out Truckee’s top five finishers. Carly Davis and Isabella Terrazas compete at the Clovis Invitational. The boys’ team also ran very well placing 14th out of a field of 32 very competitive teams. Junior, Calin Laine was Truckee’s top finisher with a personal record time of 16 minutes and 35 seconds for 20th out of 219 athletes. Sophomore Montana Montgomery (16:55) was next for Truckee, while sophomore, Ben Breuch (17:45) was the squad’s third finisher. Rounding out the boys were Ids Propstra (18:07) and KC Larkins (18:42). Senior, Elizabeth Morgan (23:12) was Truckee’s top finisher followed by senior, Ariana Kendall( 25:15). While the junior varsity boys rang in with junior, Grant Nicely (19:42), junior Jordan Guldman (20:27) and junior Evan Opsal (19:31). Wyatt Peek (19:11) led the junior varsity boys, followed by sophomore Robbie Maxim (19:34), freshman Zachary Blum (21:03), and freshman Carver Joslin (26:19). The Truckee cross-country team will next travel to the Willow Hills Golf Course in Folsom, Calif., on Saturday, Oct. 14, for the Bella Vista Bronco Invitational.